As we inch every closer to Christmas – yes, we’re excited about it and don’t even care, it’s time to check out what we’ve been playing. It’s decidedly un-festive though so don’t worry. I think I bought Grim Dawn over a year ago and in typical me fashion I’ve only just got around to actually starting the game. 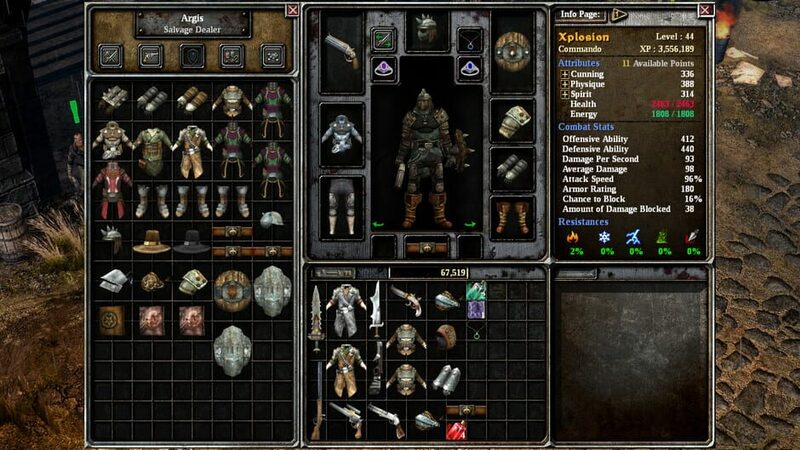 Grim Dawn is an action RPG set in a dark apocalyptic fantasy world. The game boasts hundreds of items for you to loot and earn, hundreds of skills to learn that create a deep customisation options. I’ve sunk a few hours in to the game so far and I’m really impressed with it. It reminds me some what of Diablo in the hack and slash quick pace of it. There isn’t a lot of hanging around in Grim Dawn, or loads of talking to characters. The first few hours have mostly been me fighting my way through hordes of zombies and other weird creatures and it’s been a blast. I quite like that Action RPG’s like this and Diablo get straight in to it and don’t have you going through loads of exposition or tutorials just to get you to grips with the basics of what’s going on. The fact that it has up to 4 player online co-op is a bonus too as all my friends own it and I’m sure we can have a good laugh playing it together. Honestly I’ve barely scratched the surface of what the game has to offer, there’s still a whole load of crafting to learn, a whole different skill tree that I’ve not even really looked at yet, dungeons that appear later on. It’s £20 on steam at the moment, but I’m pretty sure I paid around £3 in a sale, so if you’re interested in it, keep an eye out during the winter sales. If you like Diablo and other Action RPG games I don’t see why you wouldn’t want to check out Grim Dawn. Last week I mostly talked about the multiplayer side of Battlefield V. This week I wanted to just touch on the War Stories side of the game. But I will only briefly talk about them because they’re quite frankly a bit pants. I’ve actually only played one of them, and pretty much have no desire to play the others… The mission I played sees you playing as Solveig a Norwegian resistance fighter. You’re trying to rescue your mother and take down a Nazi operation that revolves around Heavy Water. Obviously it all looks amazing and the setting under the Northern lights in the snowy mountains looks fantastic. But the gameplay is generic, the story bland, and the character development non existent. It’s a real shame because I actually think building on this story more could’ve been a really interesting one. Project Winter is an 8 person multiplayer survival game with a bit of a twist! There is a traitor in your midst, well potentially more actually, and you have no idea who they are. The idea of Project Winter is to get rescued from your snowy hell-scape and to it you’ll have to work together to gather resources and repair certain objectives randomly dotted around the large map. You have 30 minutes to complete your task, but all the while the traitors will be among you trying their best to sabotage your quest. There is a central cabin that you can all go to to craft items like axes, walkie talkies, guns etc… And around the map there are lots of storage rooms that you can open up to get the loot inside, although you’ll need to the help of others to open the locks. The traitors on the other get access to special crates hidden around the map that will provide you with items to help you betray your fellow survivors. But be careful opening them because they’re pretty loud and could give away your true intentions. It’s not due to launch until early 2019 but they have been running some close alpha testing over the last few weeks which I’ve been lucky enough to be a part of. I really love the visuals atheistic of the game and the gameplay itself is fun, if a little buggy at the moment. I actually found that a lot of people were very chatty and up for a laugh when playing which was really nice and made the whole experience a lot more fun. Personally I think the game has a lot of promise and could be a really fun game to play with some friends. The traitor mechanic is really fun and even with complete strangers I still had a lot of fun figuring out who was trust worthy. I’m currently into week 3 of fatherhood, and also my 3rd week off work bonding with my baby boy. The timing for this time off work couldn’t have been more perfect as Red Dead Redemption 2 was released the week before he was born, and Pokemon Let’s Go for Switch dropped while I’m still off work. It’s no secret that there are many disgruntled Pokemon fans around due to the fact that the new titles to the Pokemon franchise heavily capitalise on the success of the mobile phone app Pokemon Go! There are many changes to the formula that break the traditional monster hunting RPG adventure. Wild encounters have been changed. Instead wandering around long grass anticipating an attack, you can see Pokemon running around in the wild and approach them to catch them. Instead of battling them to low health, you now chuck berries and balls at them to catch them. Levelling up your Pokemon is completely different now too. While you gain experience from trainer battles, you also level your Pokemon up by simply catching more wild Pokemon. It doesn’t matter what you capture, but the expertise in which you catch it dictates how much XP you’ll attain (also the level of the wild Pokemon you catch). And to continue with the toning down of the game, it seems that the trainer battles are really quite easy. I spent quite a lot of time in the Viridian Forest, repetitively catching Caterpie, Weedle and their evolution’s in the process of trying to level up my Oddish and Butterfree in preparation for Brock and his rock type Pokemon in Pewter City. The tricky thing is, all the Pokemon in your party attain XP, so while my Oddish was slowly making it’s way up to level 10, my starting Pokemon Pikachu, and the first Pokemon I caught were storming levels higher than usually anticipated so early into the game. Eventually I went to the gym to take Brock with a seemingly under-powered and under-levelled Oddish to take on his Geodude & Onix. It would turn out that his Pokemon were very low levels, and that my level 13 Oddish would knock out both of his Pokemon with one use of Absorb. I wasn’t expecting that. Despite all the changes to the franchise for this iteration I have to say that I simply love it. It’s like a dream come true seeing Kanto in these visuals. I put together a piece on a game that defined me for our friends over at Normal Happenings, and explained how the day to see Pokemon in glorious visuals was going to be a huge moment for me. It really was something special seeing the world represented like this for the first time. And I’ll go on and say that I actually really love the fact that you can see the Pokemon running around wild in the grass rather than the wild battle mechanic. The smile that shot across my face when first approaching route 1 and seeing a Rattata playfully running in different directions from grass patch to grass patch, then just further up some Pidgey seemingly hanging out together flying around was incredible. I cannot express how much this game is making me smile. The capture mechanics sure are a tad different and none traditional, but you do get a rather great sense of pride throwing a perfect Pokeball at the Pokemon you’re attempting to capture. However that said, the rate you go through Pokeballs is staggering. Just approaching Mount Moon exhausting 80+ Pokeballs, of which only 30 Pokemon were transferred to Professor Oak. Thankfully victory in trainer battles often tends to them giving you some Pokeballs as a price as well as money. It’s not to everyone’s liking, more so the ultra competitive Pokemon players that worry about IV’s, EV’s and SP Attacks and the like. For me, it’s never been about that, it’s been about the journey and completing the Pokedex, and as of right now and where I am in Let’s Go Pikachu, I’m anything but disappointed, I think there are some legitimate great shakeups to the series that were very brave to take in the first place. Yup pardner, I’m still on RDR2 as-well. Fortunately 3 week old babies don’t do much other than cry, sleep and poop. So when he’s not crying I can still maintain some good gaming time. I’m currently plugging my way through chapter 4 which see’s the gang in a new camp just outside of Saint Denis. I have to admit while incredible, the standard story missions up to chapter 3’s finale weren’t overly exciting to be honest, but then the final few missions begin and the stakes increase. So far chapter 4 has been much more engaging and there have been some great moments around the camp to. Without going into spoilers I enjoyed the party in the camp in celebration of a safe return of a camp member. Not much more to add other than the game still completely blows me away visually, and with more exploration completed, I’m finding some pretty awesome stuff like Dinosaur bones and clues left from a serial killer with miscellaneous body parts. Juggling this and Pokemon though, woah boy this’ll be tough. Recently we’ve had an influx in Switch games to review which has certainly been a pleasure. They’re all out on eShop now excluding Storm Boy which hits tomorrow. Our review for Storm Boy will be out later as to not break embargo, However you should come back to check it out as it’s a beauty. But you should check out our recently published reviews for SkyScrappers, Monster Loves You! and ROCKETS ROCKETS ROCKETS.